A frequent mistake — one of which I am as guilty as anyone — is using the performance of the broad U.S. stock market indexes, and the companies that comprise them, as a proxy for the performance of the U.S. economy. Until the late 1990s, that might have been a reasonable presumption. Since then, however, most of the large companies reflected in those indexes have transformed themselves into global enterprises with global supply chains, global sales, global workforces and global sources of capital. That their shares are listed on a U.S. stock exchange is something of an historical artifact. Steve makes a great point, that other journalists need to read very closely as well. I might write up a list of 10 “do’s and don’ts” for writing about the global economy. That’s very impressive. Very. The U.S. was around the OECD average in reading and science, and just below average in math. All other things being equal, it would be better if our scores were higher, much higher. This will take a long time to fix. However, the short-run implication is clear: American kids coming out of college right now are facing ever-toughening global competition. The question: What sets of skills are most likely to be in global and U.S. demand? Are Trade Deficits Bad for Long-Term Growth? Like most economists, I’ve been trained to believe that running a trade deficit is not an indication of economic sin, and running a trade surplus is not an indication of economic virtue. Indeed, I’ve written at various times about the virtue of running a trade deficit, if the foreign borrowing was used to fund investment. Well, I’ve been changing my views about trade deficits, and the latest European financial crisis just brings me further along those lines. It’s not Greece that troubles me, it’s Spain and Germany. A few years ago, Spain was the darling of investors and economists. Spain was running a trade deficit, yes, but it was vibrant and growing. From 1995 to 2005, real per capita GDP in Spain grew at an excellent 2.8% annual rate. Germany and Italy have been the laggards in terms of growth since the start of EMU in 1999. 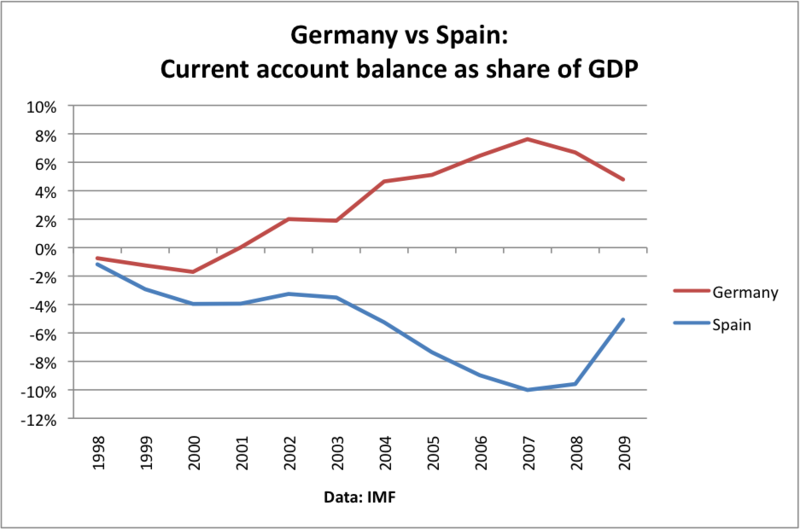 However, Germany did have one advantage —it ran trade surpluses where Spain ran trade deficits. In fact, the gap between Germany’s surpluses and Spain’s deficits widened over time, even though Spain had stronger growth. If it turns out that Spain runs into a financial crisis because of all its external debt–accumulated during the good years–then we will have to go back and ask whether that growth was sustainable and real. And the same thing goes for the U.S. The U.S. had strong per capita GDP growth and a big trade deficit, and then was hit by a massive financial crisis. Score one for the trade deficit as a more accurate signal.